I’m continuing to play with some of the ideas and thoughts that are flowing in and from Jude Hill‘s class, Considering Weave. Mixing up cloth and wool and thread. 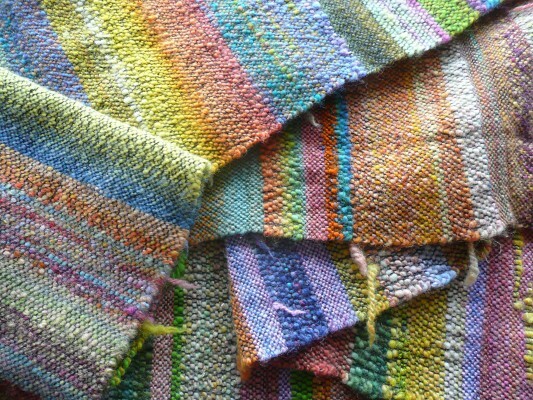 Mixing up tapestry and rag weaving and twill. Not being precious. Not worrying about ‘wasting’ time or materials. Just following the intention of the moment and watching what happens. 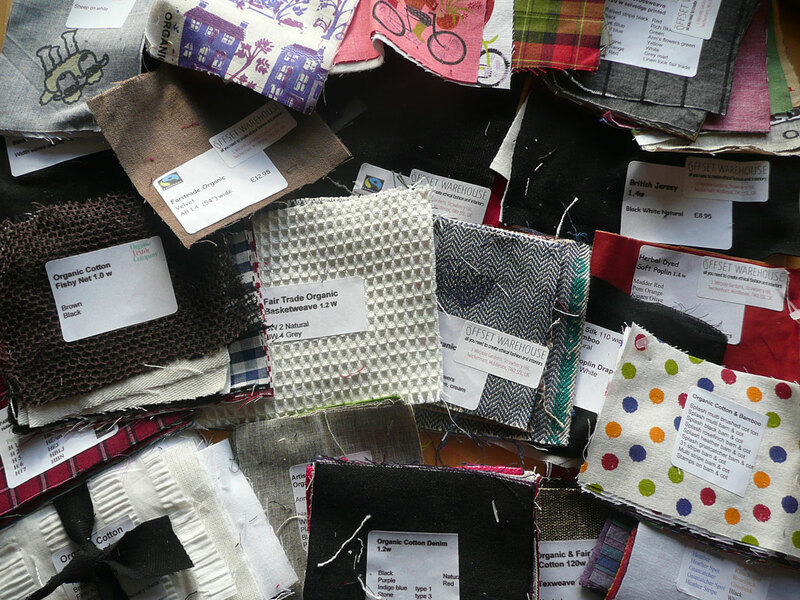 This summer I’m taking part in a class with Jude Hill – Spirit Cloth – considering weave and its relationship to stitch. I’ve never done a class with Jude before but I’ve long loved her ‘what if’ approach and it’s stimulating to be part of a curious, experimental community for a few months. 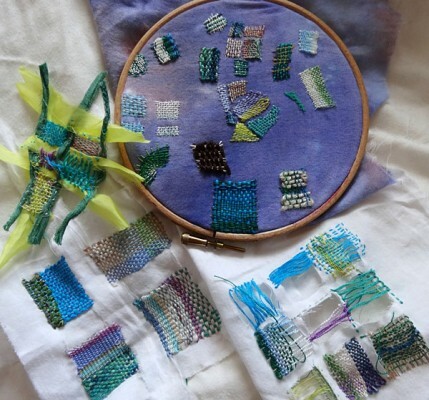 We’re currently exploring weaving into cloth, a kind of intentional darning. I did a little darning last summer while I was travelling backwards and forward to Wales (where Alan was walking), inspired by the work of Hilary Hollingworth, and by the Big Mend group on Flickr. 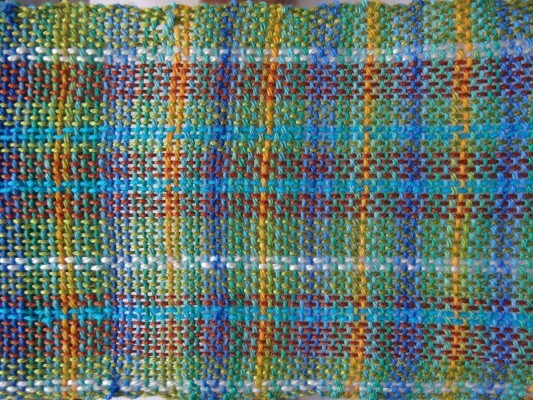 Where I wove across a hole (as opposed to laying the warp as long stitches across the surface) I found it hard to stabilise the edges – now, watching and listening to Jude with her respectful mastery of cloth, I have learned how to do that, and gained new inspiration to try again. Out of those experiments came this piece, ‘Island Patterns’, worked on handmade felt, without cutting. 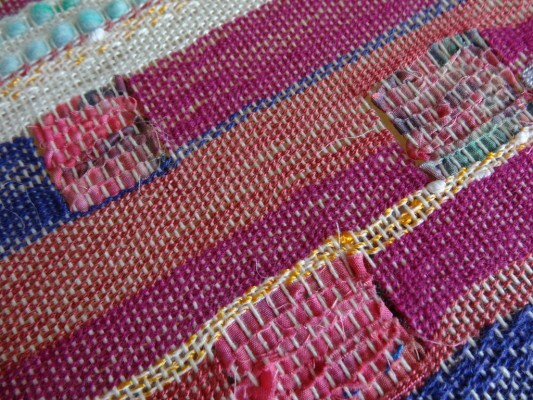 There is more of a distinction between the background and the weaving than if you fill a hole with weave. Less integration. More floating. 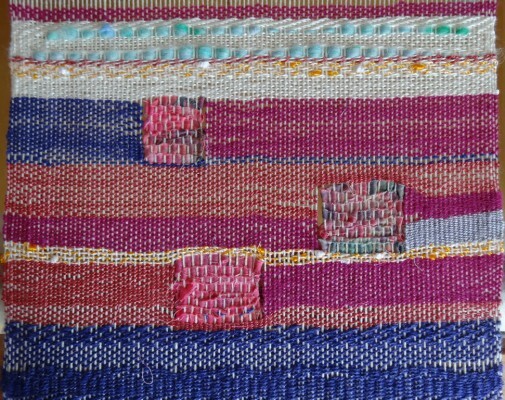 I love weaving at this tiny scale. Last night. 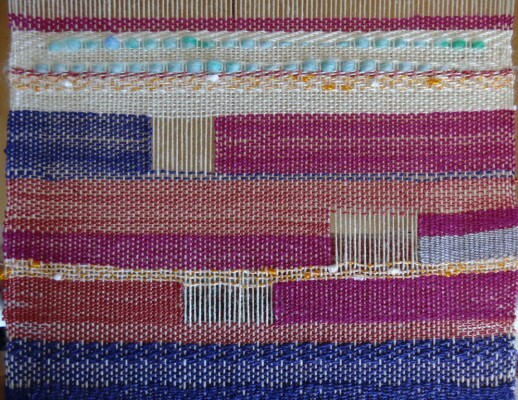 thinking ‘what if’, I wove some little windows into the work I currently have on the loom. And this morning I filled them with cloth. I like the change of texture and scale. Looking forward to exploring this further and seeing where it goes. A few weeks ago was the 7th Tiree Tech Wave – the Tech Wave is a twice yearly design and tech retreat run by my husband Alan. 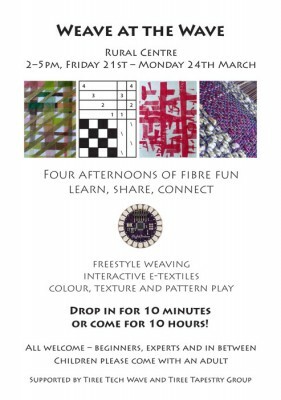 This year I decided to join in the fun with ‘Weave at the Wave’, a ‘come and play’ session each afternoon in the cattle ring. We had five looms set up, a couple of rigid heddles, a small tapestry loom, a table loom on a stand and a Saori loom with 4 shafts, plus some mini projects weaving on cards and CDs, and a box or two of LilyPad Arduino bits and pieces for e-textile experiments. 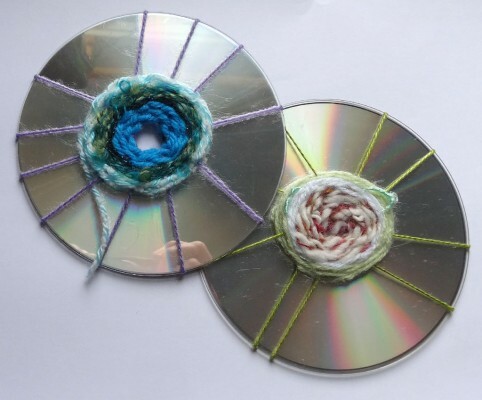 I forgot to take any pictures but there are some here by Jacqui at Tiree Living, and these are a couple of partly woven CDs. (If you want to try this I recommend this tutorial by Make It… A Wonderful Life.) People of all ages enjoyed making these. 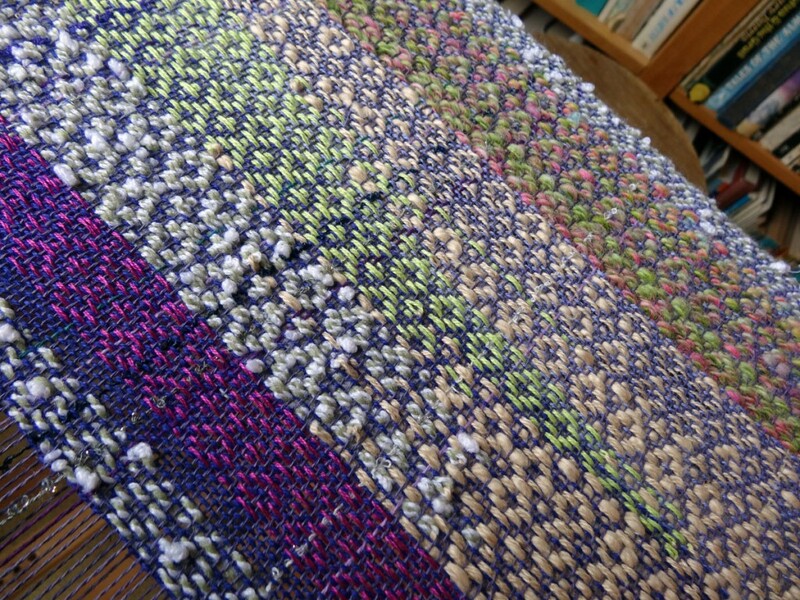 Someone started this lovely skinny scarf on the Ashford SampleIt loom and borrowed the loom to finish it at home. It’s hard to believe she’s never woven before. With the e-textiles, one person made dreadlocks that light up, and another wove a headband, then stitched a circuit into it that lights an LED from a battery. I hope we’ll be able to do this again in the Autumn. In fact I wish I could think of a way to do it more often. 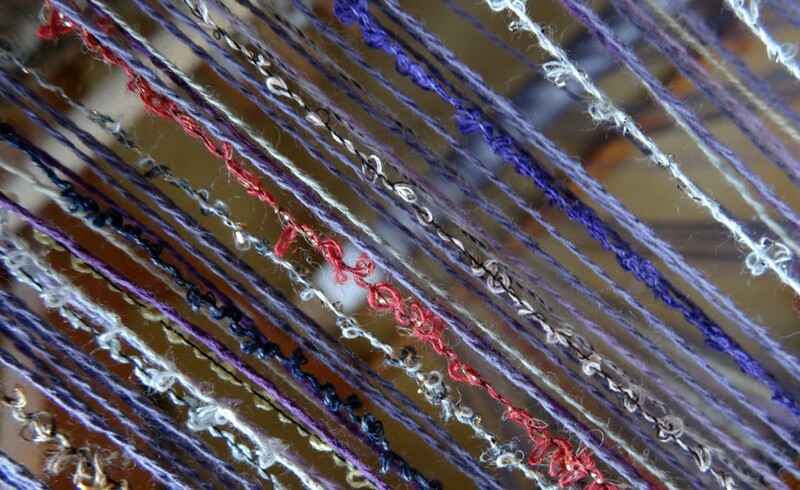 At Woolfest this year, I bought a pre-wound warp from the Saori Shed – mostly purple cotton with a bit of texture and sparkle. I’ve been winding my own warps since I used up the pre-wound warp that came with my loom and I enjoy the process and the choices; but this was a bit different and a special treat. In these scarves I was playing with cramming and spacing the warp and its effect on the patterns – twill on the left, plain weave on the right. Both the scarf patterns were woven on the same threading, but I didn’t think there was enough warp left for a third and in any case I wanted to try some Saori play with pattern. 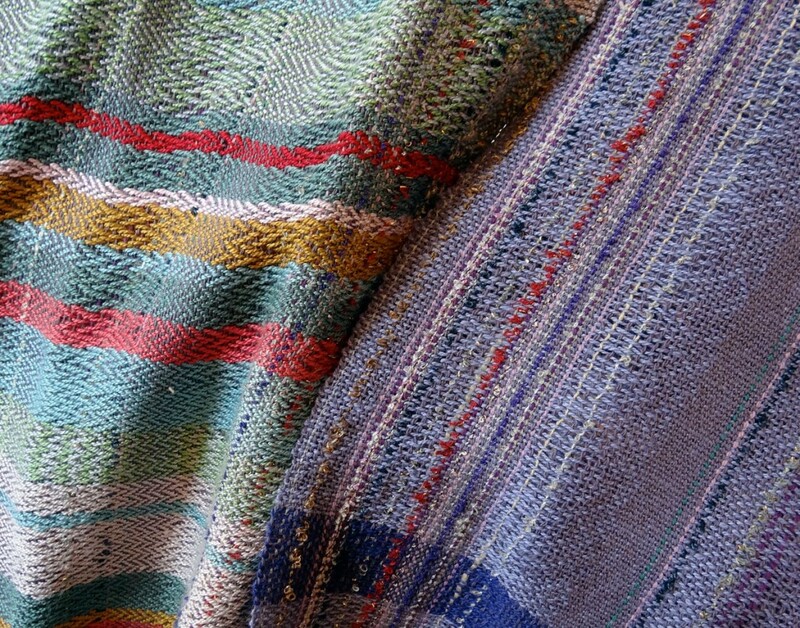 Two weavers who use pattern in ways I find very inspiring are Susan Johnson of Avalanche Looms and Judy of Fibres of Being. I particularly like Judy’s Saori-style interpretations of the rosepath pattern. So I’ve rethreaded the heddles and have been trying rosepath in various yarns. It’s exciting to see all those wonderful little dots appearing as if by magic… Are they not-quite-diamonds or almost-circles? I’m not sure but I love them. I realise how often I don’t post here because I take so long to write a post and get images together; and how counter productive that is. So just a note about a couple of things I’m doing. The latest in the withdrawn warp experiments, this is bigger than the previous one, 36cm long, and was woven on the tail end of the first warp on my new Saori loom. 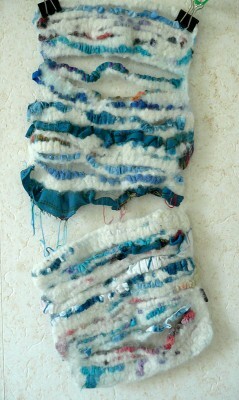 The fibre was combed top, with an assortment of frayed fabric strips. I’m beginning to get an idea of how this could develop. This is the first length of fabric I wove on the loom using the pre-wound warp that came with it. It’s mostly handspun yarns and the warp is cotton. Apologies that I haven’t yet trimmed the ends on the back. Offset Warehouse, while looking for a heavy organic fairtrade cotton. I sent for their sample set and it arrived yesterday. I love the range… They sell reclaimed fabric as well.